STOP PRESS! Two new C64 game cartridges from RGCD have just arrived and are available to buy from our shop page now! First up is the final retail version of Assembloids, the frantic-paced puzzle/reaction game from Enthusi, iLKke and Conrad that came second in last year's RGCD game development competition. Based on Quartet, an original flash game by Photon Storm, Assembloids is all about assembling faces from four sets as quickly (and completely) as possible against an increasingly tight time limit. Already proven to be one of our most addictive and highly acclaimed C64 releases to date, the game is available on cartridge from RGCD (in either standard or deluxe packaging, complete with manual, sticker and printed code sheets) or on cassette from Psytronik Software. The standard version of Assembloids is priced at £20 inclusive of UK/Europe shipping, and £21 for the rest of the world, whereas the deluxe version costs £25 (UK/Europe) and £27 (rest of world). The Psytronik cassette version costs £3.99 (plus shipping). Read more about the game on the Assembloids project page here. Also released today, and following on from last year's authorised cartridge release of Fortress of Narzod, this compilation of frantic shooter MineStorm and oddball platformer Spike complete Peiselulli and Linus' acclaimed 'Vectrex Trilogy'. Originally developed exclusively for the Vectrex console, through negotiating with Jay Smith of Smith Engineering/Western Technologies (via his son Spencer) RGCD and TRSI are proud to present the official C64 conversions of two undisputed retro classics. With this retail compilation featuring PAL/NTSC compatibility and save-disk support to keep a record of those high scores, Spike and MineStorm require no keyboard input and are designed to work on the C64GS as well as regular commodore computers. 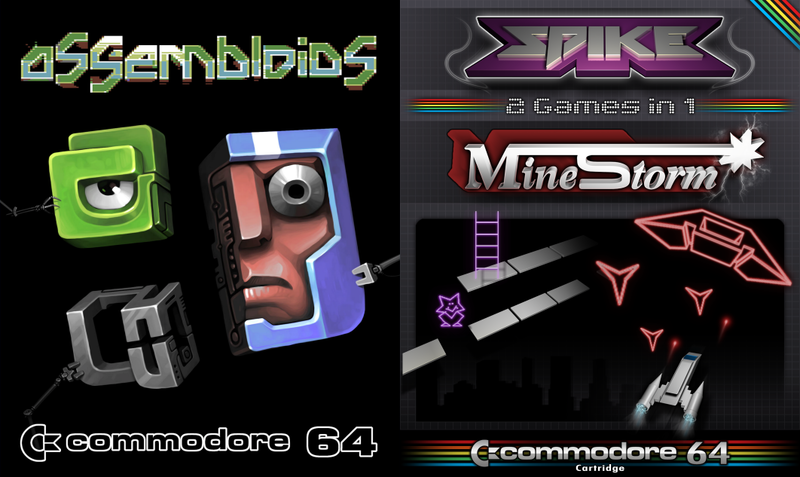 More information can be found on the games over on the Spike/MineStorm project page here. Available now from RGCD, again in both standard or deluxe packaging complete with a printed manual and RGCD sticker. The standard version of Spike/MineStorm is priced at £25 inclusive of UK/Europe shipping, and £26 for the rest of the world, whereas the deluxe version costs £30 (UK/Europe) and £32 (rest of world). These games just get better and better! Fantastic packaging - well done James & Co! i always admired those vectrex conversions, good work, guys! Sometimes the most simple ideas works best. I think Assembloids is an execellent game. Soulless, Get 'Em DX and Space Lords are FREE!